So, apparently it’s just been a really good year for dramas. Especially romantic comedies. I have fallen in love over and over and over this year. And here we go again, with Beautiful Gong Shim… which is not only romantic, but hysterical! I don’t even know where to begin to explain how awesome the main two characters are. Gong Shim and Ahn Dan-Tae are such a bizarre, adorably weird, memorable couple. 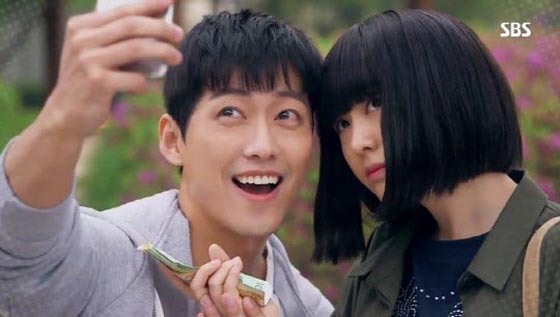 Gong Shim wears a plain cut wig because her hair’s been falling out in chunks due to stress. She has a beautiful, successful older sister, her mother is a former Miss Korea, and she is the black sheep of the family – the less attractive, invisible, oddball artist who can’t get a job. She’s also hysterical, over dramatic, feisty and fearless. On a personal note, I absolutely loved her style… everything she wore was so perfect on her. Ahn Dan-Tae is the bum who lives in the upstairs roof room, wandering the streets in flip flops and capri pants, eating all his meals from the convenient store. Though he’s a lawyer, he rarely charges his clients so he works as a driver at night to pay his rent. He’s incredibly goofy, carefree, good natured, and honestly… totally adorable. This is the same actor, Namgung Min, that just scared the pants off me in Remember with his mesmerizing performance as a psychopath, so it was awesome to see him turn his acting skills to this offbeat lovable performance. The plot is about Gong Shim finding her footing in the world and falling in love, but it’s also got a great birth secret mystery with rich family shenanigans going on in the background. There are so many great characters and never a dull moment… but I’m too charmed by the lead couple right now to properly review the actual storyline. You can trust me, the story is great. Everything about this drama is great. It’s a winner. The romance is… atypical, to say the least. These two run around like crazed teenagers half the time and it’s really fun to watch. There’s a lot of physicality in their performances – and you could tell they had a blast making this show. They also both have extremely expressive faces and it’s a nonstop play of growls and frowns and pouts and smirks and smiles with them. Gah, they were so ridiculously wild and cute! Overall Rating – 10/10. Maturity is Highly Over Rated. ← Review – Me Too, Flower!